Do a fair amount of driving in Florida, and you'll run into a toll road. When that happens in a rental car, it can be a pricey gotcha. While it's technically possible to get around in Florida without paying a dime in tolls (every decent GPS and mapping app offers an "avoid tolls" setting), that strategy will significantly increase your travel time. If you avoid tolls from Orlando International Airport to Disney World's Epcot, it doubles what would otherwise have been a 25-minute drive. The typical 70-minute drive from Disney Springs to Cocoa Beach becomes 40 minutes longer. Heading from Miami International Airport to South Beach? Your 18-minute drive will take over half an hour. You get the picture. 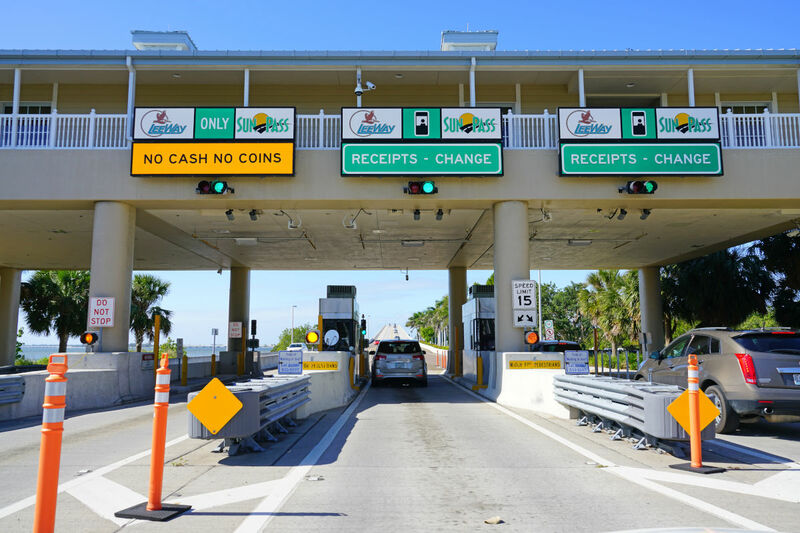 Compounding the problem is that a good chunk of Florida's toll roads—especially those in South Florida—don't take cold, hard cash, so you'll be dealing with all-electronic tolling. Ignore the signs saying you can pay by mail. The toll authorities bill by license plate, which means the rental car agency is going to receive your bill, and they'll happily pass on the charge—along with a surcharge—to you. Rental car companies know that you will need a solution for paying tolls, of course, so they offer a convenient but expensive toll pass. If you rent a car from any of the major rental car companies, buying a toll pass will cost you a fee ranging anywhere from about $3 to almost $11 per day. For a week-long rental, that convenience could add as much as $75 to your bill, on top of the tolls themselves. (An exception is Silvercar, which merely passes on the cost of the tolls without imposing an additional fee for the transponder.) If you don't opt for the toll pass and accidentally going through a few tolls, you can ring up quite the bill. The Florida toll quagmire conspires to pressure you to buying a toll pass from the car rental agency. While this might make sense in some cases, many travelers—especially those on a longer vacation—find that buying their own passes a better value. You might already own a toll pass that will work in Florida. If so, it makes sense to bring it with you and use it in your rental car. Live in the South? If you have a portable transponder from either Georgia's Peach Pass or North Carolina's Quick Pass, you can use it in a rental car on a Florida trip. The Northeast's E-ZPass now works on roads operated by the Central Florida Expressway Authority but, alas, not Florida's Turnpike. The two main toll passes in Florida are the Florida DOT's SunPass and the Central Florida Expressway Authority's E-PASS. If you're planning your trip in advance, the E-PASS is the better option because it's free to order a single-use sticker transponder (a portable, reusable plastic transponder costs $10) and you'll pay a lower rate on some Orlando-area toll roads with the E-PASS compared to the SunPass. If you can't order one in advance, however, the SunPass is easier to buy once you're in Florida, with a wide variety of retailers stocking it. With SunPass, a single-use pass will run you $5, while a reusable pass costs $20. Whichever platform you choose, you'll need to deposit a starter kitty of $10 into your account, which will be automatically debited as you drive through toll stations. 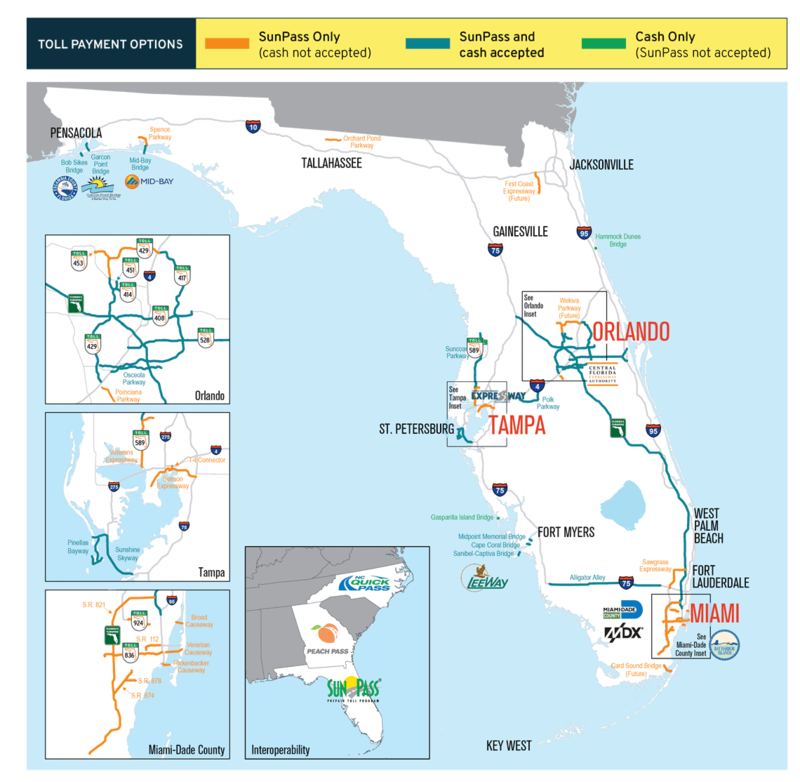 Florida's most extensive toll-road network is in and around Orlando. It's almost impossible to leave the airport without encountering a toll road, since the two main expressways from the airport are tolled. The main highway out to the Space Coast has a toll, as do the two major north-south alternatives to the often-congested Interstate 4. In South Florida it can be hard to avoid toll roads, too. Again, the main route out from the airport is tolled, as are multiple causeways between Miami and the island of Miami Beach. Heading south to the Keys? The main route down, Florida's Turnpike, has a toll. If you're flying into Miami and heading to Southwest Florida, you'll encounter a toll on I-75's Alligator Alley. To add insult to injury, the region is converting previously free freeways to toll roads. The Tampa area is a little easier to get around without paying tolls, though there are a few expressways you might accidentally run into if you're heading east or north from town. The toll you're most likely to encounter is the Sunshine Skyway bridge, which links St. Petersburg with the Bradenton-Sarasota area just to the south. Bottom line: You may not be able to avoid tolls, but you can avoid paying through the nose for a toll pass if you follow our advice.